Ukrainian National Chornobyl Museum » “ABANDONED LAND” DIRECTED BY GILLES LAURENT (BELGIUM, 2016). FREE ADMISSION. News and Events : “ABANDONED LAND” DIRECTED BY GILLES LAURENT (BELGIUM, 2016). FREE ADMISSION. “ABANDONED LAND” DIRECTED BY GILLES LAURENT (BELGIUM, 2016). FREE ADMISSION. 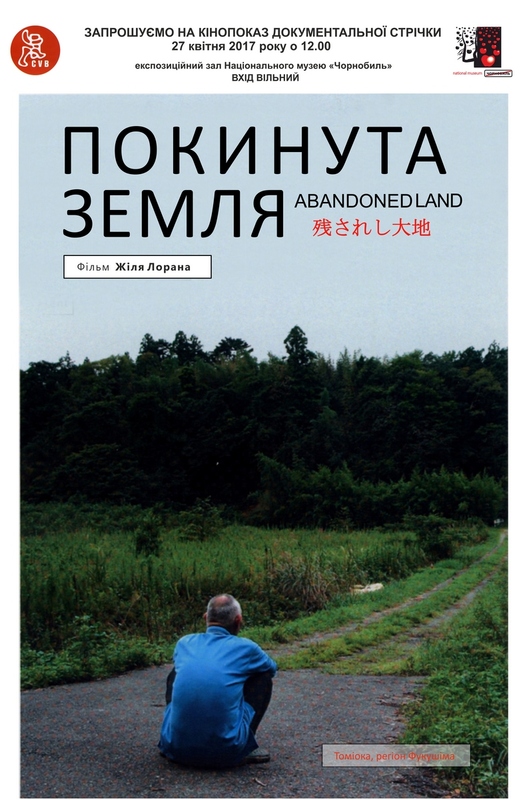 On April 27, 2017 at 12.00 in the exposition hall of the National Museum “Chornobyl” will be screening a documentary by Belgian film director and screenwriter Gilles Laurent “Abandoned land”. The film is about the exclusion zone around Fukushima nuclear power plant. Gilles Laurent was killed during the terrorist attack at Maelbeek subway station on March 22, 2016. Expected to participate by Ms. Claudine Van O, promotion-dissemination manager of CVB-VIDEP in Brussels. In the evacuated zone around the nuclear plant of Fukushima, 5 years after the “catastrophe”, a few sparse individuals still live in this abandoned land, burning with radiation. This film follows them in their daily lives at the moment when the works of “decontamination” orchestrated by the Japanese government seems pretty derisory given the scale of the quake on both the human and environmental levels. The apparently peaceful and rationally irrational existence of these few diehards is in all points a question of survival and reminds us that a patch of land is, in the final analysis, our strongest bond to the world. Gilles Laurent was on his way to watch a final edit of the film when he was killed during the attack at Maelbeek subway station on March 22, 2016.